Completed in 1922, the Keewaydin Clubhouse (later the Mercer Island Community Club) served as a community meeting place for the residents of Mercer Island, Washington until the early 1960s. In 1966, it was purchased by the Veterans of Foreign Wars (VFW) Post 5760 in whose ownership it remains today. The Keewaydin Club was organized on November 29, 1921 by members of the Mercer Island Community Club. The club combined all of the Island's north end improvement clubs. As a new organization, the following officers were elected to serve one year terms: W.S. Foster (president), H.C. Raymer (vice-president), C.H. Cole (secretary), Dr. L.E.A. Hooey (treasurer) with trustees G.A. Abramson, N.V. Berglind and H.H. Riley. Early promotional material for the club denotes that: "The Keewaydin Club was formed for social purposes exclusively. It is meant to serve as a medium for cementing the friendly relationship of the members, fostering a spirit of neighborliness, elevating the social life of the community and furnishing an adequate place in which to congregate when the need presents itself." Based on that premise, club members began planning immediately for a building devoted strictly to social purposes. In May of the following year a lot was purchased and cleared, concrete was poured, and on a single day, July 1, approximately 60,000 feet of lumber and 58,000 shingles were hauled up the steep slope from the barge that had brought the cargo from Seattle. The Clubhouse was completed in 1922 using volunteer labor by a variety of club members. Seattle architect Ernest R. Williams, who was a member of the club, designed the building. Williams designed the Clubhouse in the Colonial Revival vein and took full advantage of the triangular shaped lot. To the northeast side of the building was an open porch, which afforded expansive views of Lake Washington. To the southwest was a kitchen and dining wing. The main entrance, highlighted by a formal classical surround, complete with sets of double pilasters, presented a fitting entry for club members. The origin of the name Keewaydin is not definite, but may have derived from an Indian word meaning "the north wind" or "home wind," (for when the wind blew from that direction the trail led home). For reasons unknown the club changed its name to the Mercer Island Community Club shortly after the Clubhouse was built, but continued to call the building the Keewaydin Clubhouse. The Clubhouse continued to serve as a social center for the Island for the next 50+ years. During the 1930s and 40s the organization shifted its focus from purely social issues to community issues, such as discussing problems ranging from fire protection, to water rights, to transportation issues. Other activities included a variety of lectures, and a monthly forum, which gave the island residents a strong voice in county and state governmental policy. Among the more notable projects in which the community club played an active role was the construction of the Lake Washington (later renamed Lacey V. Murrow) floating bridge. Some of the members from the Club's most active years during the 1920s and 1930s included: John Dunney, voted an honorary member in 1924; C. H. Cole, J.W. Baker, C.E. Goodson, M.W. Tomlinson, John H. Van Marten, C.V. Lersea, C.E. Williams, P.A. Kenyon, E. R. Williams, H.H. Hawkins, and O.B. Daniels. By the early 1960s, the Community Club, after the merger with the South End Club, discontinued meeting in the clubhouse and it stood vacant for several years. Then in 1966, VFW Post 5760 purchased the building. 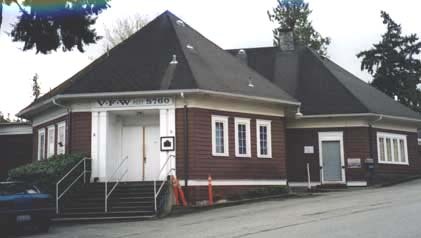 The VFW post currently utilizes the building as its meeting hall, and rents meeting space to other Mercer Island organizations including the Masons, Eastern Star, Job's Daughters, Irish Dancers, and the Sons of Norway among others. VFW Post 5760 was chartered shortly after the termination of World War II. Principal organizers were Nelson Rochester, Ben Jacobsen and Harry Marshall. Chris Lillions was the first post commander in 1945-46. The organization's purpose is fraternal, patriotic, historical, and educational. The Keewaydin Clubhouse is a rare, surviving example of an intact, early community clubhouse in King County and is the only remaining community clubhouse on Mercer Island. The building also represents the only known work of architect E.R. Williams, and is a good example of the Colonial Revival style. In the spring of 2001 the Society placed a plaque outside the building. The plaque was made possible by a donation from Hunter Simpson.